Want to take your workouts to an extreme level? Are you a P90X graduate looking for a new challenge? Or maybe you’re in good shape and need something to take your fitness level up a notch. Insanity by Shaun T. will deliver exactly what you need! With Insanity, your personal trainer Shaun T will push you past your limits with 10 DVDs packed with cardio and plyometric drills, and max cardio intervals of strength, power, resistance, and core training. No equipment or weights are needed, and you don’t have to be in extreme shape to do it. 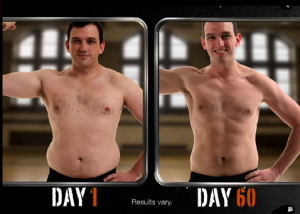 If you are ready to dig deep to get the body you always wanted, Shaun will help you get insane results in just 60 days. The secret to these mind-blowing results with Insanity is MAX Interval Training. Shaun T took traditional interval training and flipped it on its head—you perform long bursts of maximum-intensity exercises with short periods of rest. Each workout keeps you constantly challenged as you alternate between aerobic and anaerobic intervals performed at your MAX. The result: burn up to 1,000 calories in an hour and get the most insane body in 60 days.